While Lederhosen originally served as hard-wearing work pants, today they are one of the hippest fashionable cultural assets. They have long been worn not only on traditional occasions in Germany, but have taken carnival and theme parties worldwide by storm. Whether Munich, New York, Barcelona or Sydney: every celebration with zest for life around the world, must not miss Lederhosen. While the leather pants have been worn mainly by men in recent years, the traditional Lederhose continues to convince more and more ladies and thus often replaces the classic Dirndl - certainly not only because of the high wearing comfort. The German costume is richly embroidered, decorated with buckhorn buttons and usually has suspenders with bib or a wide leather belt. In the context of Lederhosen usually a Trachten shirt is worn - which is usually characterized by its checkered pattern -, the calves can be covered by coarse-knit knee socks or nice Loferl (= calf warmers). Usually with that, simple, robust leather shoes, often also hiking boots are worn. The outfit is rounded off by a hat, which is usually decorated with the so-called "Gemsbart" (= tuft of chamois hair on a hat). 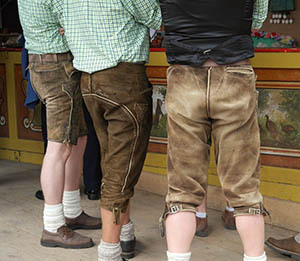 In addition to the classic Lederhosen for men, which are usually black, gray or brown, there are also countless, modern versions of the typical alpine knee breeches. Whether light blue, white or red: Here you will find a wide range of different colored pants. 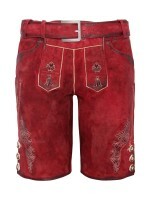 Lederhosen for women are also available in pink, brown-pink or green. Further distinctions are offered by the materials. Here we carry high-quality models from different, high-quality leather types. This guarantees the highest wearing comfort. From reasonably priced goat leather to fine deerskin, there is something for every taste and budget. For which occasions is the traditional Lederhosen suitable? Of course you also have the opportunity to wear the costume or at least part of it in everyday situations. Those who show up at a party with their Lederhosen will definitely attract attention. Modern variations of Trachten clothing make it attractive to younger people who want to wear Lederhosen, Trachten shirts and hats. What actually are leather pants? Since leather is a hard-wearing, sturdy, and durable material that has been produced by the tannery trade very early in human history, it is not surprising that the Lederhosen have a long tradition as well. 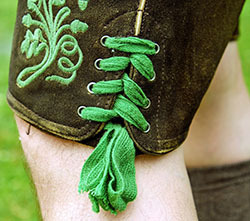 The origin of Lederhosen, which today are known throughout the world as a German national costume, lies in the so-called "Culotte". They were tight-cut breeches, which were made of fabric. At the end of the 18th century, people in Southern Germany also used this pattern on more durable leather to create a working trouser for farmers, which replaced the previously used bloomers and compared with them also offered numerous benefits. The primary use of leather pants as working clothes also explains the characteristic, short cut: this shape prevented heat build-up and gave the wearer enough freedom of movement. Preference was given to leather from domesticated animals such as goats or sheep, since their skins were available after slaughter anyway. Noble suede was, due to the hunting rights of the nobility, a privilege of higher population strata. The leather was mostly dyed black with logwood and relinquished on embroidery or decorative extras, in contrast to today’s often lavishly decorated costume. 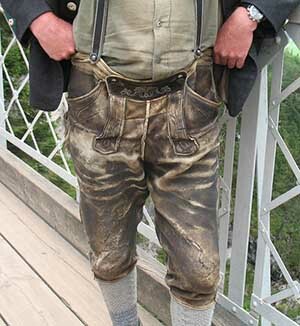 The knee-length cut (= knee breeches), which is considered a typical form for Lederhosen, is a typical example for a traditional German costume in rural areas of the Alps until today and has changed very little. Among the urban population, after the French Revolution and through French influence, Sansculottes (= long trousers), prevailed. These are also occasionally found as Trachten pants in alpine style.